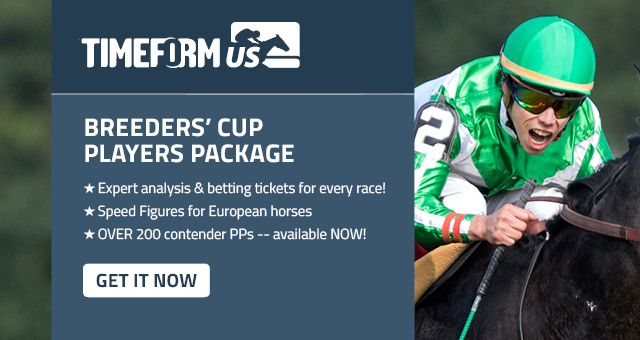 ← The TimeformUS 2017 Breeders’ Cup Package: Pre-Entry PPs Ready Now + Loaded with Exclusive Features to help you win! A few of the runners likely to attract the most play are dropping in class. Those include War Stroll (#4) and Camp Courage (#6). The former is probably the more reliable of the two, having finished a good second in a tougher spot last time at Saratoga. He’s done well at shorter distances in the past, but this drop in class bothers me considering how well he ran last time. Camp Courage has also faced tougher company in his recent races, but he just didn’t do any serious running in his U.S. Debut, and now he’s been on the shelf for more than four months since that run. There is very little speed signed on, and the Pace Projector is indeed predicting a situation that favors runners who will be on or near the early lead. Therefore, trips could play a big role in the outcome. The Pace Projector is predicting that Cordero (#1) may be in front early as he makes his first start off the claim by Brad Cox. He was in decent form prior to the barn change, and he figures to be awfully dangerous here given the circumstances. I’ll use him, but I think he could get some company up front from Djulpan. For whatever reason, the connections of DJULPAN (#2) decided to rate him in his recent starts. He didn’t handle racing in behind horses two back and then was inexplicably dragged back to nearly last in the early stages of his most recent start. He’s run his best races when he’s up on the pace, and I think Jose Ortiz will revert to those tactics as he gets back aboard here. I know that some others have run faster speed figures, but I think Djulpan will stack up favorably against this group if he gets the right kind of trip. looky for that good rider change to joel in the 8th ….